This DVD has dramatic and rare footage of the Crash Recovery of a L-100-30 Hercules that sadly crashed shortly after takeoff from Kai Tak. Many airliners in this production are also now extinct due to the modernization of the world's airline fleets. The classic Cathay Pacific and Dragonair Tristars are joined by Singapore Airlines Classic 747s, a very rare Thai Airways A300 in experimental colors (in service only 4 months), many MD11s including Delta and Korean, a rare Aeroflot color scheme, USAF military aircraft, and the short-bodied 747SP. 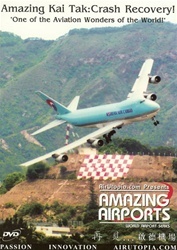 One of the most memorable airports in history, long since closed is seen here, up close and personal. And of course LIVE ACTION!